I love Vogue's Fashion Nights Out; it's a one night of pure fashion bliss. I remeber once, me, my friend and her boyfriend walked past David Gandy. Who else has a little crush on him? They dared me to go up to him and say hi, but for once I was rendered speechless! Previously, I usually spent FNO at Old Bond Street and Regent Street but this year I thought it would be good to mix things up and spend FNO on Oxford Street. There was a whole lot of events being hosted . I wore my vintage silk shirt from Spitalfields Market , high waisted jeans and brogues; a little on the pyschodellic side. I was invited to House of Fraser to spend some time there on FNO; they had a huge variety of events throughout the evening. For starters, Millie Mackintosh launched her new collection. I am in love with the green shift dress; the colour really stands out, the print is so 60s and I love the finish on the back of the dress with the exposed zip. It comes in orange too. Which dress do you prefer? After viewing the collection, I went to the Tea Terrace afterwards. I fell in love with the place. It's grown-up yet girly. They also had the cutest and most unique tea pots for sale and a light made up on spoons! Some of the tea pots were for sale. The designs are so quirky. There was a small exhibition of Vogue covers within the Tea Terrace. It was a shame that it was very small but I loved being able to look at some previous covers. Among the events, House of Fraser were hosting a treasure trail in conjunction with Vogue; Vogue magazines were scattered around the department store, and prizes were given to those who found them. I found one in the Tea Terrace and my prize was Clinique's Dramatically Moisturizing Lotion! Other prizes included leather jackets. Now, the beauty section of House and Fraser was where the party was really at. Yves Saint Laurent make-up artists were providing makeovers with the opportunity to be photographed, DJ Jameela Jamil was playing tracks throughout and mixologists from Mahiki were over to concuct drinks just to name a few. One of the brands that really caught my eye, was the perfume company, Meet The Creators. It's set up by two French ladies and one British lady. One collection of the perfumes was based on the London creator's interpretation of certain London postcodes. The perfumes ranged in different scents. I'm not a fan of fruity perfumes but I do love floral scents. I absolutely adored the Note De Luxe Evody eau de parfum and the design of the bottle was simplistic yet sophisticated. The Radley dogs came out to say hello at FNO. Aren't they so cute? House of Fraser have a great big online sale at the moment, so head over to their website for some fashionable steals. I decided to venture off to a few other shops so I went to H&M where they had a blow dry bar from Blow Fast Beauty. There was the opportunity to get customised tote bags too. The final place I went to was Nike. H&M felt a bit lacking in terms of the events they were holding, but Nike did not fail to bring up the goods like House of Fraser. Calgary Avansino held a talk about fitness and healthy eating but I missed that. Do you remember when I ran Nike We Own the Night? Well, Equinox were at Nike providing some fitness-related advice and it turns out that Sylvester had been at the Equinox tent at the We Own The Night Run ( I told them I loved the warm up the Equinox team provided as well). Found out that Equinox may potentially be opening up other branches across London. Whose excited about that? Marcus showed me the Functional Movement Test, which Equinox personal trainers provide to clients. It sounds very complicated but basically you stand in a lunge pose whilst holding the pole with both hands behind your back. The aim of it is to find out whether you have any movement pattern issues that will most likely expose you to an injury. They also provided some advice on how to use foam rollers - a great item to have in your gym bags for pre or post work out. You can buy Nike foam rollers here. The Kiehl's boys were at Nike too, in the signature white lab coats. I got a tiny, weeny bit excited but it was great fun chatting to the boys ( found out they use Kiehl's products on their beards to maintain soft and shiny beards haha!) 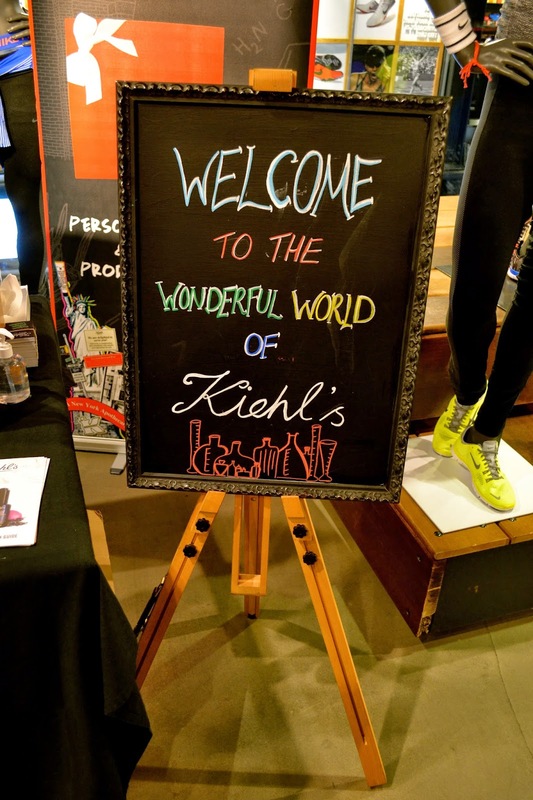 Found a few products to add to my must-buy list and discovered that Kiehl's has a new store on Regent's Street. And then I browsed and saw a lot of trainers I really like (need a new pair for le gym). When it comes to trainers and Nike, I don't think you should buy their trainers for running if you need ones for overpronation or supination. I personally believe that Nike are more interested in design over function, which means the technical aspects to trainers are hindered. However, for going to the gym or for casual outfits, I do like Nike because in my view the technical aspects aren't important. What do you think of these trainers? I can't decide. They're all so pretty and cool! Fashion Night Out is a night you won't forget; live djs, celebrity appearances, oodles of free goodies, customised items, huge discounts as well as quick makeovers, manis and hair styling. It's shopping with a party atmosphere. For that reason, because almost every high-end and high street store participates in the event, make sure you decide beforehand what you want to do. Some shops do the most minimal for the night whilst others, like House of Fraser, go all out. I look forward to many more FNOs in the years to come.